In our new town, there’s a quilt store. Obviously I wouldn’t move anywhere that didn’t have one. I’ve started frequenting there, not always to buy something (lack of funds), but more of to introduce myself and start meeting other quilters and branching out. Making friends and having fun when the boys are in school is my goal. Recently, I’ve taken to quilting a lot. 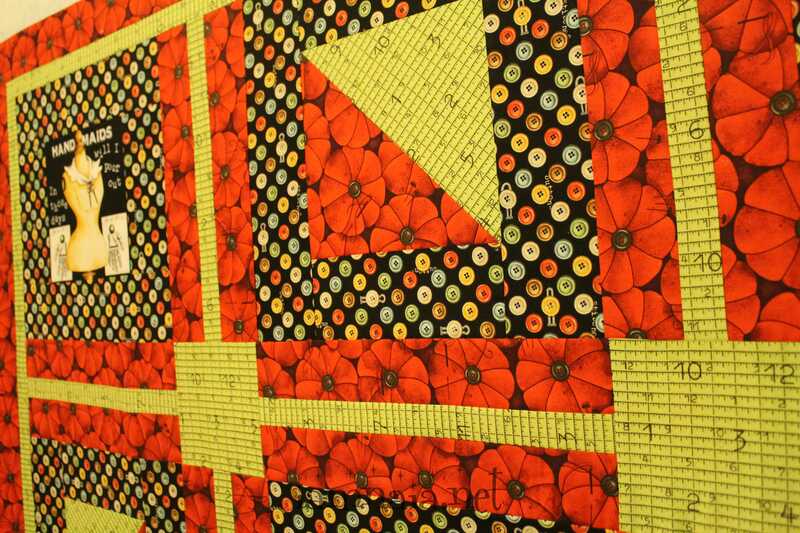 So much, in fact, that I have an entire tote’s worth of quilts to take to the quilter on my next trip to Idaho Falls. I still have a few to pick up from him and not quite sure where the money is going to come from but I can’t stop myself. I have so many ideas in my head and I just want to get them done. Anyone who is an artist of sorts understands, I’m sure. 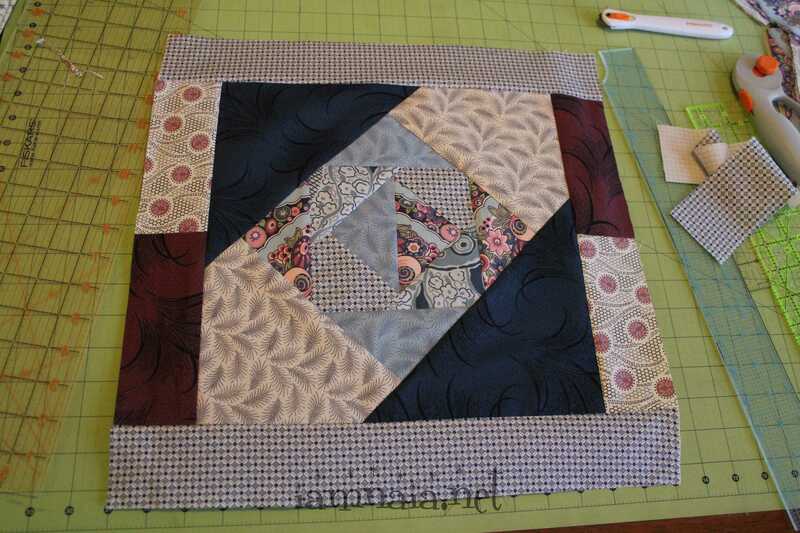 I’ve already posted some pictures of the quilts I’m working on and I may post them again as I get caught up on this post in my blog. I’m just excited to share! 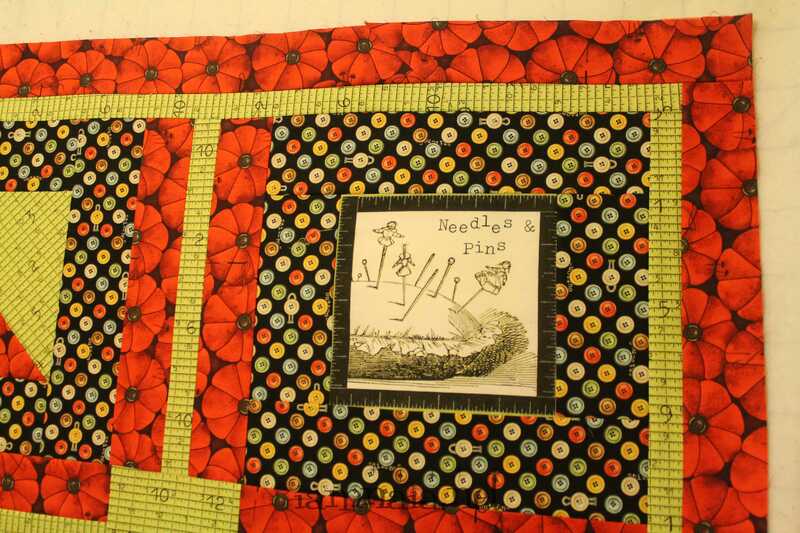 My friend Liz has been whining and making noise about me making her a second quilt. Monday, January 20th, I pulled out a set of fabric I’ve had since my store closed and set it out. 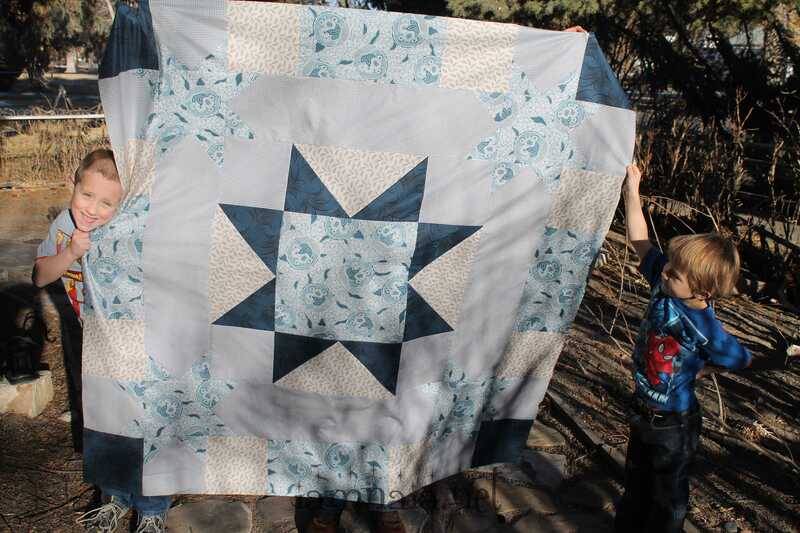 It requires over a hundred small 5″ squares sewn together into a pattern. The style that they introduced for speed-making these half-square triangles was interesting and opened new doors for me. 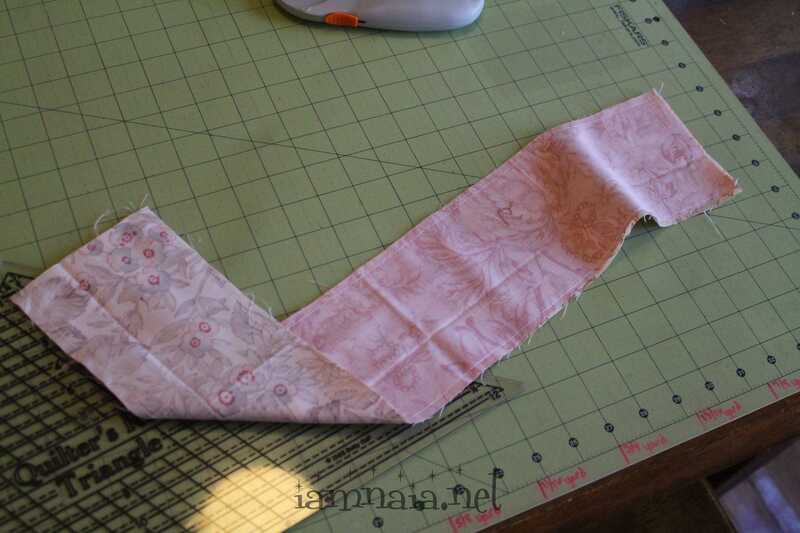 It starts with sewing two 4.5″ strips right-sides together. You stitch on both long sides. 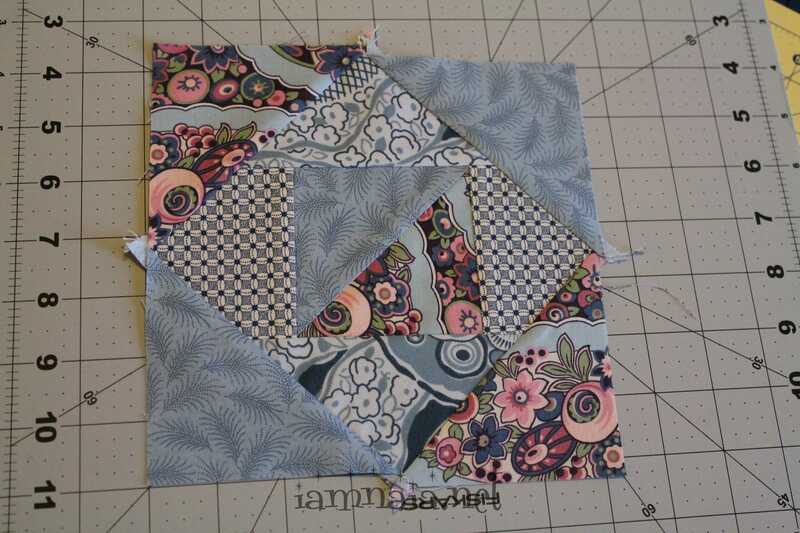 Using a Quilter’s triangle, you cut at the 5″ line. 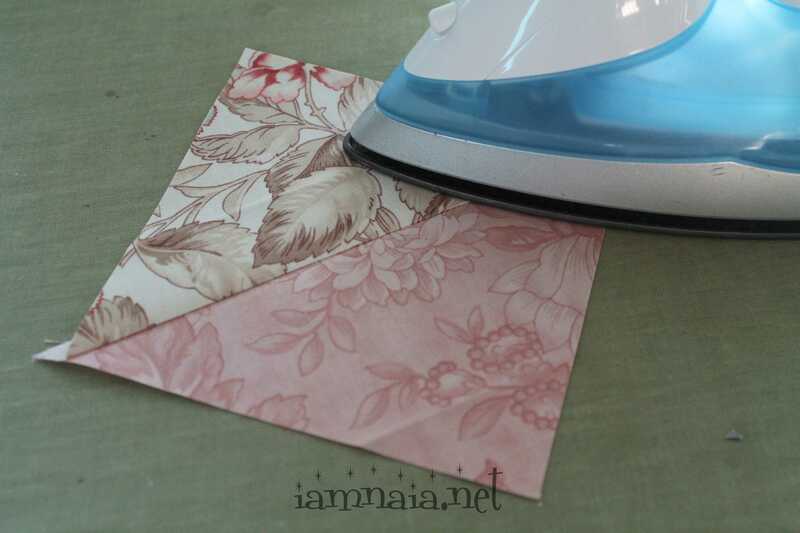 Iron it open and, after trimming, you have a 5″ half square triangle. 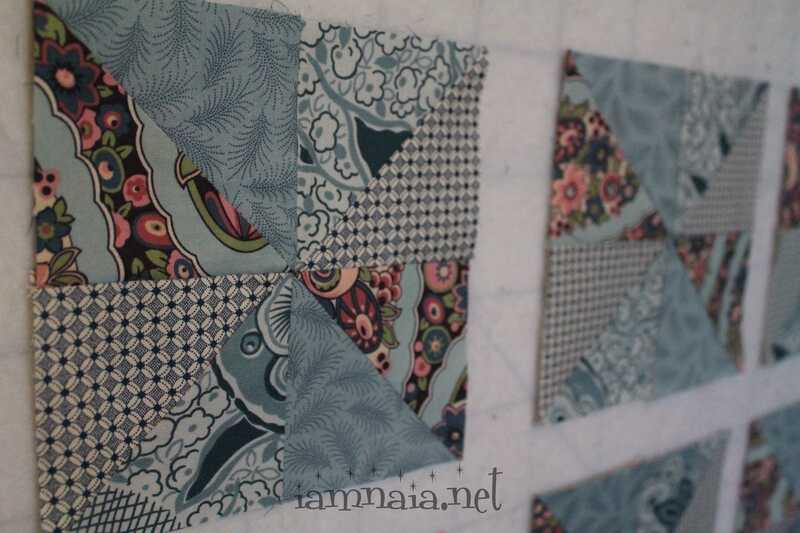 Very shortly, you have hundreds of little half square triangles to trim and then sew together. This quilt is still “in progress” so I can’t show you the results, just yet. 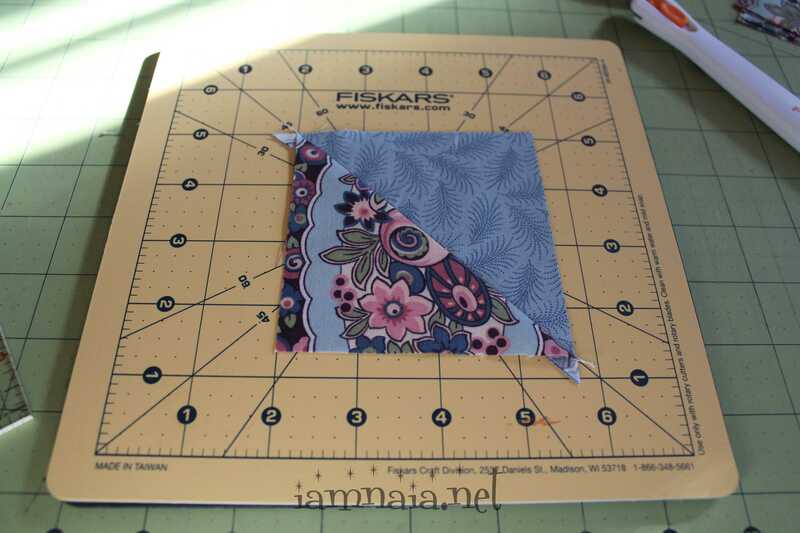 Trimming them down to 5″ square by hand was getting frustrating, so I head on down to the local quilt store to see if she had a 5″ square template/ruler I could use. I head on down and the owner told me that she did not have that size template ruler for me. 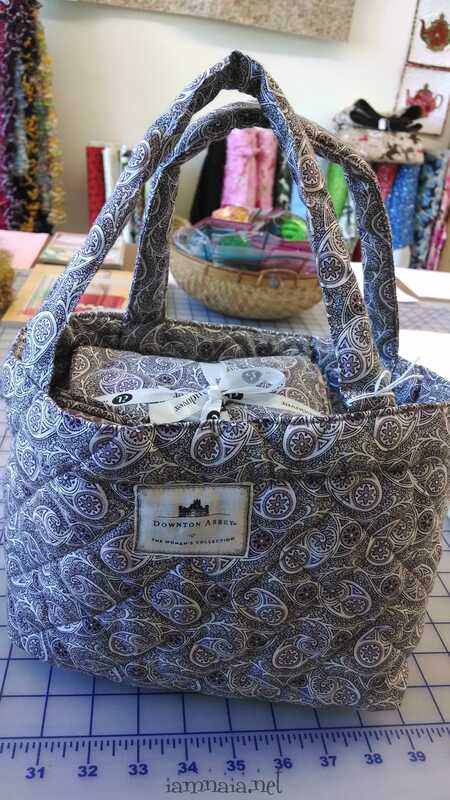 On a side note, the owner has a bag full of Downtown Abbey fat quarters that I’ve been staring at since just before Christmas and, at one point, I offered to trade a full set of about 100 patterns I had left over from my store for this bag of fabric. It is so beautiful and the bag is just darling. During this visit, she declined that offer but, since she’s seen most of my work, asked me if I would make a few sample quilts to hang in her store in exchange for the bag of fabric I want. 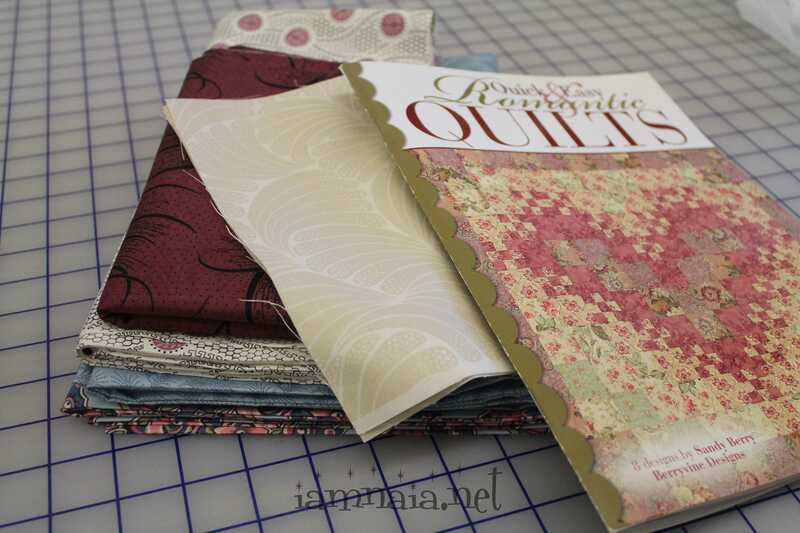 She had a specific pattern and book in mind that she is trying to sell and that’s what I’d use for her sample lap quilts. 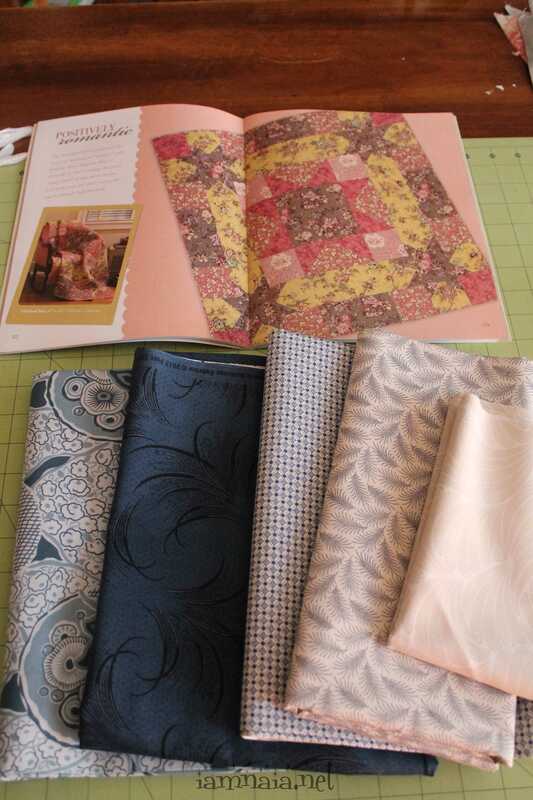 That would be the pattern she wanted me to make from the book and fabric she is trying to sell. I immediately agreed. I was beside myself! 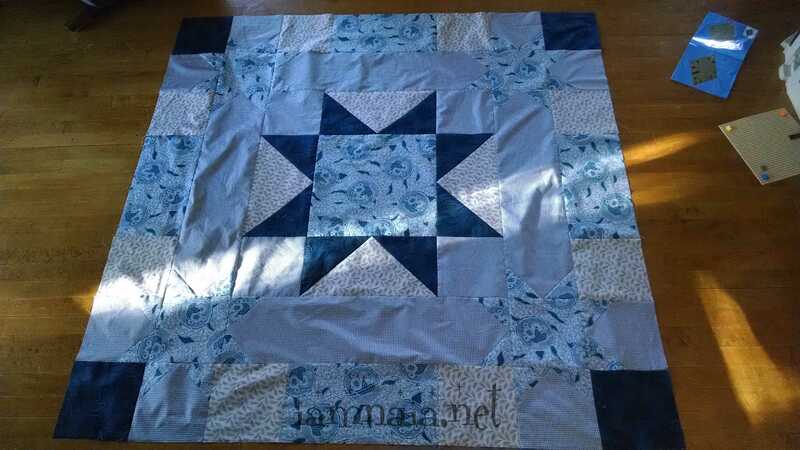 Someone actually wanted me to make something for them to show off in a quilt store! What better way to boost someone’s ego on quilt-making!? She told me not to worry and to take my time. She didn’t understand how dedicated I was, from the moment she asked me. Not for the bag of fabrics I’d been admiring so much as the fact someone asked! Three and a half hours later, I was done. Jen and the boys tried to help me get a decent picture of it but it was difficult in the wind. Laying it on the floor introduced a picture full of wrinkles. I took it down to the shop and handed it to her. She was amazed I had finished so fast. I could only try to explain the great gift she had given me by asking me to make something to show off in her store. She asked if I wanted to make a second one, from the same Downtown Abbey line, only the purples this time. She was going to be gone until Wednesday morning (this was on Monday afternoon), so there was no hurry. I agreed and set about taking the fabric home. 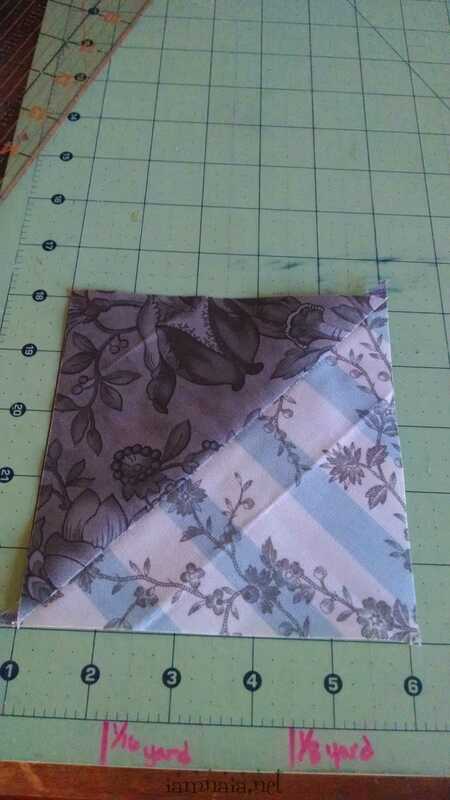 She said when I was done with this one, the Downtown Abbey fat quarters (and bag) would be mine. This all happened on Monday. 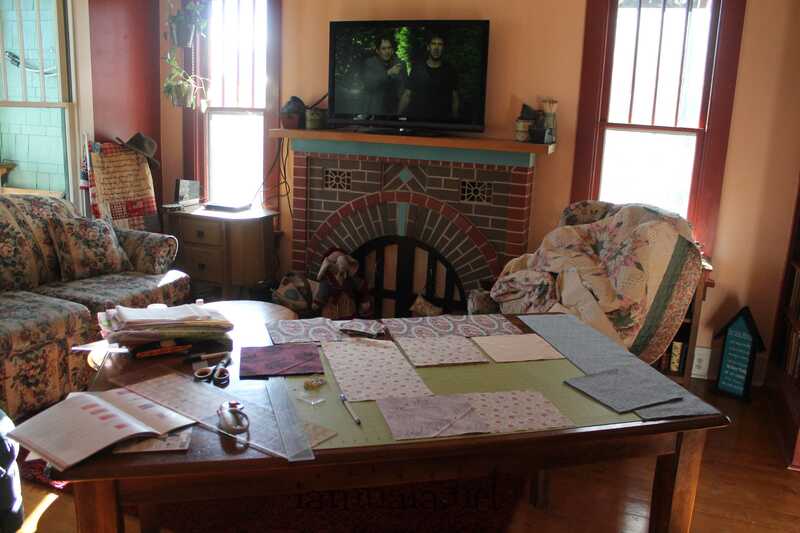 On Tuesday, the boys were back in school and I set about laying out the second quilt top. I cut all the pieces and had it all ready to go. However, I did no sewing. I got sucked into a Netflix show I was watching and did not a thing all day. No sewing at all. It sat there all day, although the table did go back into the dining room before the boys got home from school. On Wednesday morning, knowing she’d be waiting for the quilt at the store, I set about putting the pieces together. I started at 8 a.m. and was done by 10:30 a.m. I love this one so bad, I want to buy this or the other from the store owner when she is done showing it as a sample of the fabrics! I took the quilt top in to the quilt store owner and handed it to her. She was happy and that made me happy. She said she’d give me a call when she gets some more ideas of things needing samples in the store. I am more than ready for another challenge! 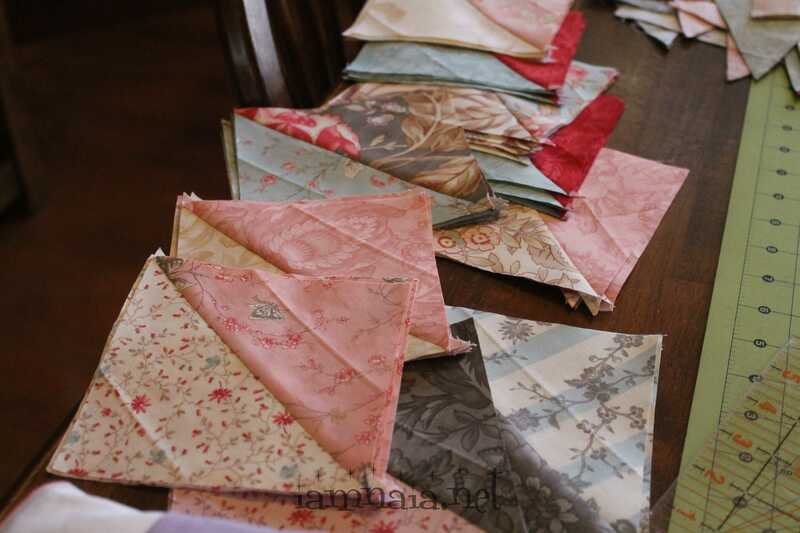 With the scraps and left over pieces, I started making some other things with these fabrics. The triangles you see above are the waste cut from the pieces of the two tops. I set about just seeing what I could do with them, paying no attention to proper size but rather trimming as needed and as I went. I sewed a back on this, as is, and use it for my new cutting mat that is able to spin as you cut things. I neglected to get a picture of that so I’ll try to get it up next time. 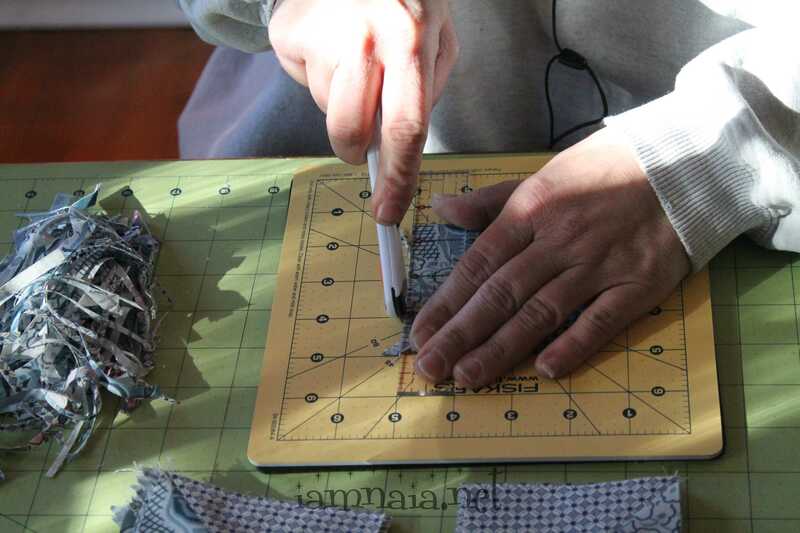 I created a second cover for this mat you see – it also spins as you cut. This one is 7″ – the bigger one is 12″. I am already in love with them and can’t believe I didn’t buy them a long time ago. I neglected to get a picture of the second one I created. I’ll get that up at some point. 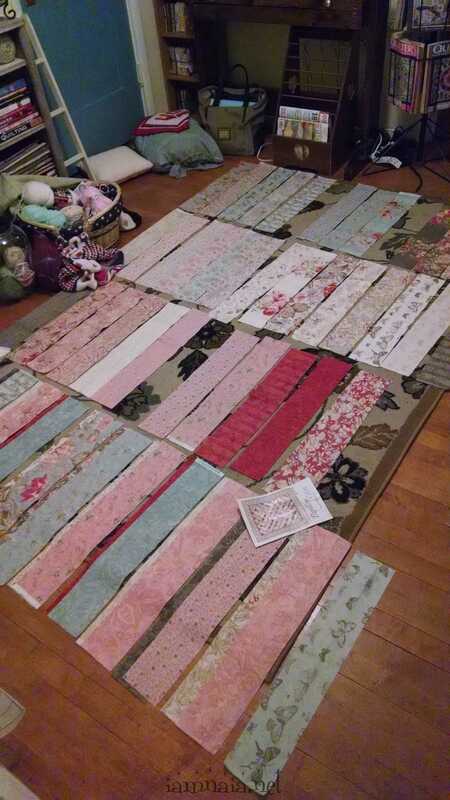 When I still had scraps left, I decided to start trying to piece together a lap quilt from the scraps left over. These are all created from waste scraps after cutting the ends of triangles. 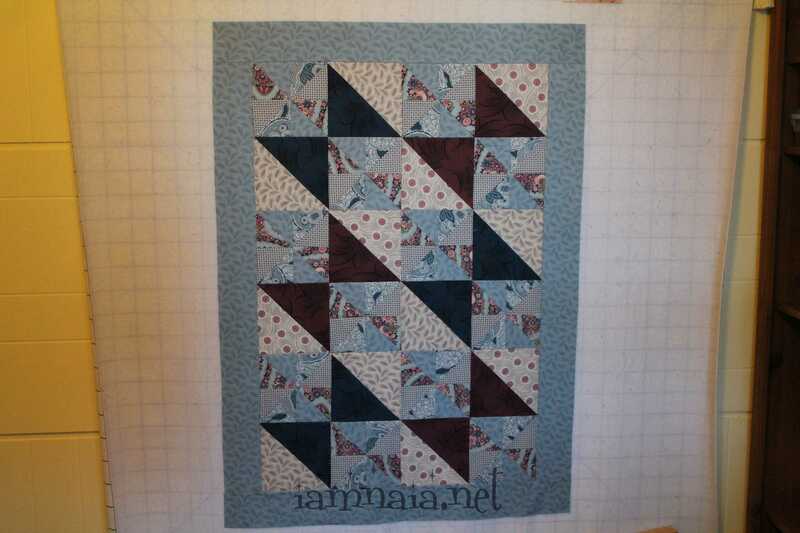 This was a good start but how to make it bigger – a lap quilt of some size? I went through the scraps and kept sewing and cutting. There was no pattern. Just sewing what I had together. This is what it looks like right now. 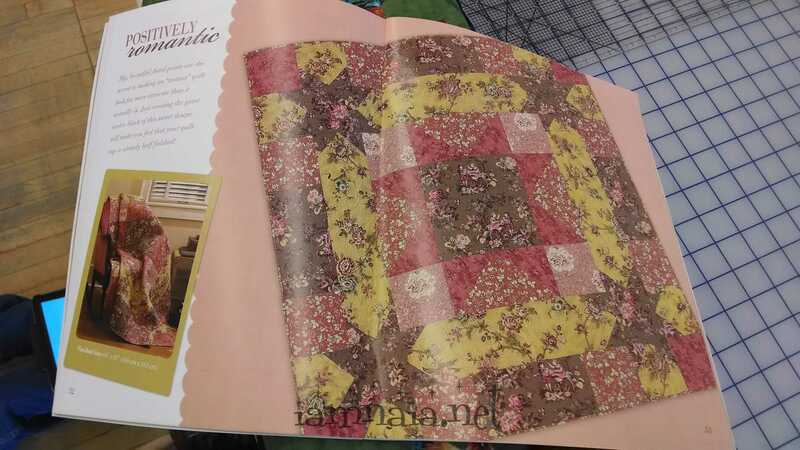 I’m going to add more to it with other scraps from the same line; however, I took it to the same quilt store owner here in town and she’s using it as a sample for others to get ideas from. 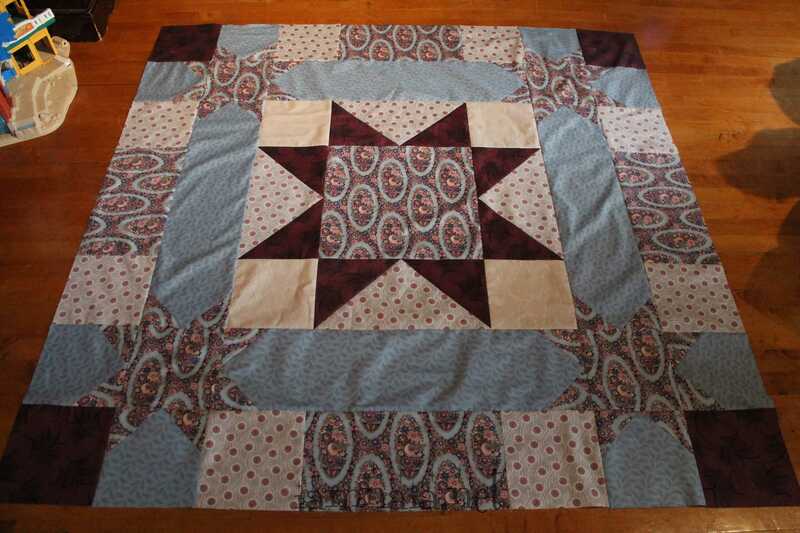 I told her that it was created entirely from the scraps of fabric she gave me to make those two lap quilts. Did I mention I love this small cutting board that spins for trimming smaller squares? You’ve got to get one, if you don’t have one already. Things go so fast and easy! When I took the small quilt top to the store and gave it to the lady to show off in the store, I repeatedly mentioned that it was scraps. Things she could tell others when selling the fabric. Mark made mention that it might not have been a good idea to tell the owner all about how much I made for myself from the scraps of free fabric she gave me. I am not sure I understand – I made what she asked to the specifications the book stated. There was left overs when done. Is it so wrong to make things for myself from what’s left? 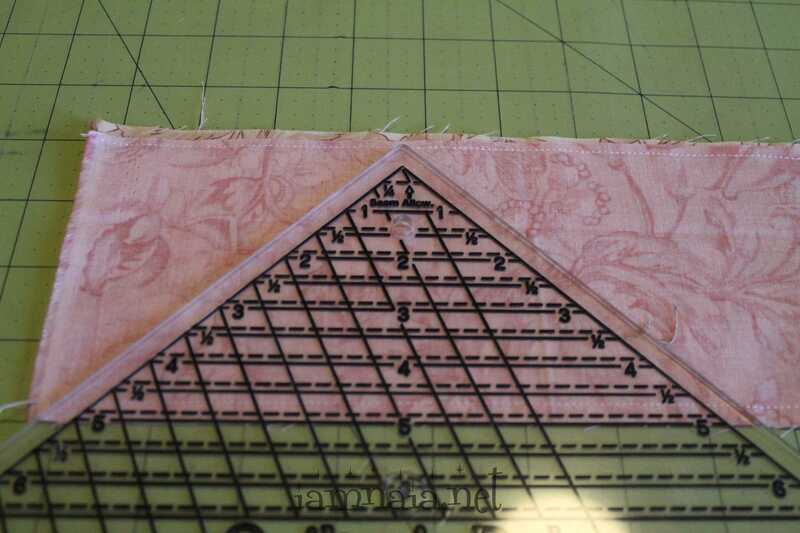 Most of it was what was cut off as half square triangles and such were made! I started thinking about it and, with a set of fabric I bought from the owner with the intent of making another sample for her, decided to just give it to her to keep in her store. The blue lap quilt I was creating from scraps I really wanted to keep but this new set for another line she was trying to sell – she could keep that. I’d be ok with that, since everything I do can help her store stay open. 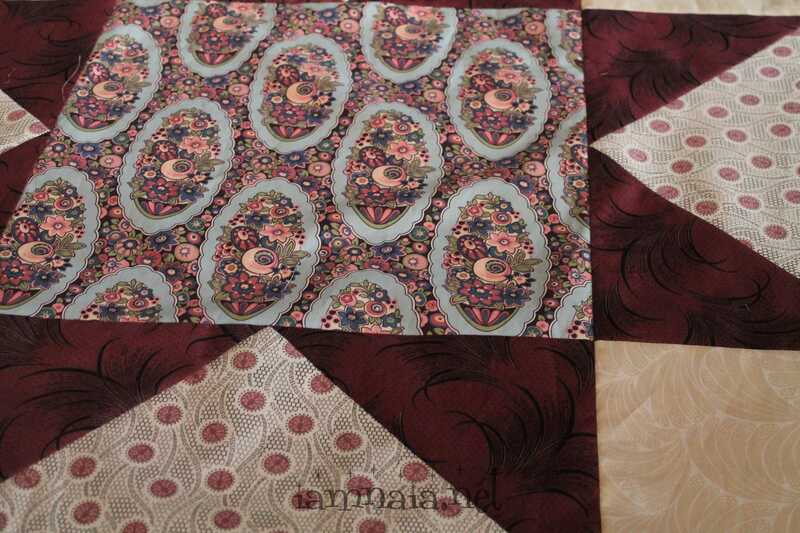 Want to see what I created from 1 yard each of four fabrics? 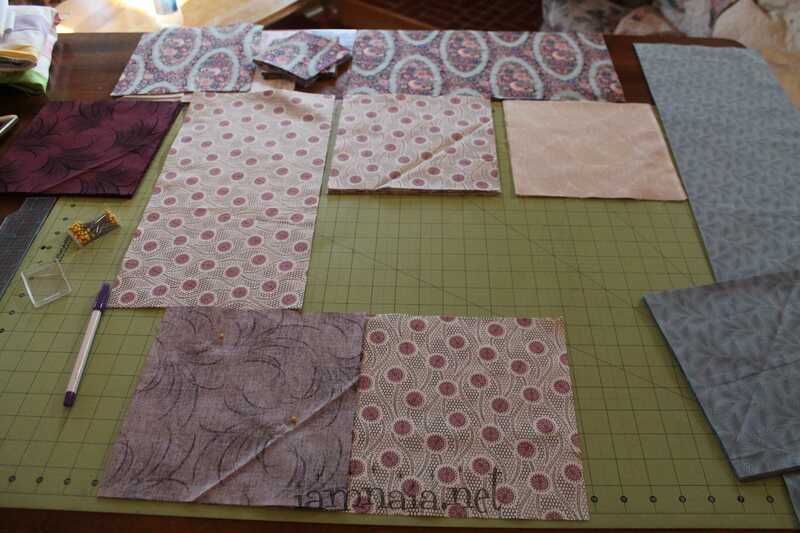 This is entirely a pattern building in my head as I was sewing – I had nothing written down and was “winging it” from that one yard of each I had purchased. It started with trying to square off the blocks with printing on them. For some reason, those blocks are never square – they come off the bolt tilted and uneven. 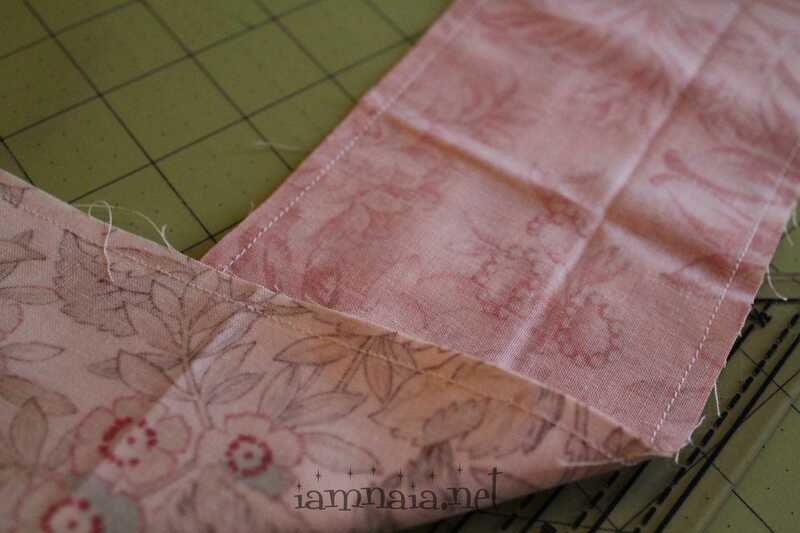 I sewed borders to them and trimmed them to 13″ to square them off. After doing that five times, I wanted to find a way to lay them out. The four half square triangles were my next idea – as a way of framing the pictures. When done with that, I had to decide how to put sashing in. Normal sashing seemed so boring, I got an idea to do a 2″ of the red, 1″ of the yellow/green and then another 2″ of the red. 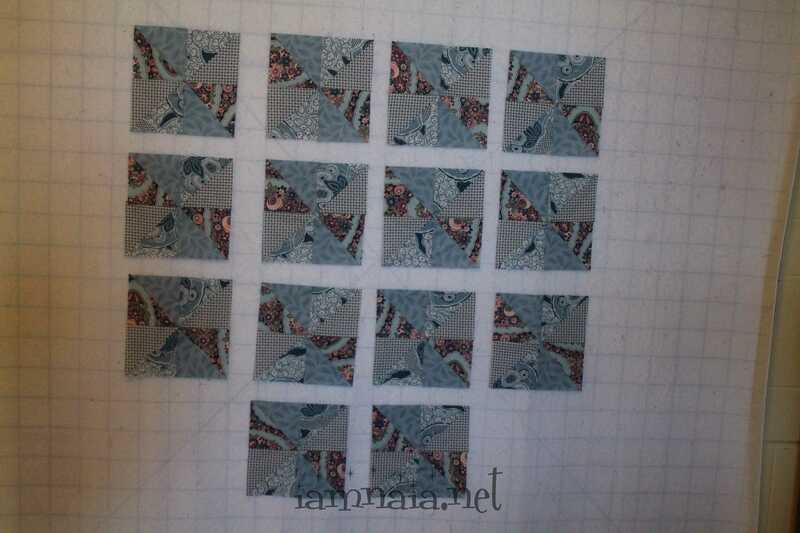 I sewed the rows with their sashing pieces and set it on my design board. I wasn’t sure I wanted the same lines to go across and cut off the yellow/green lines going up and down. 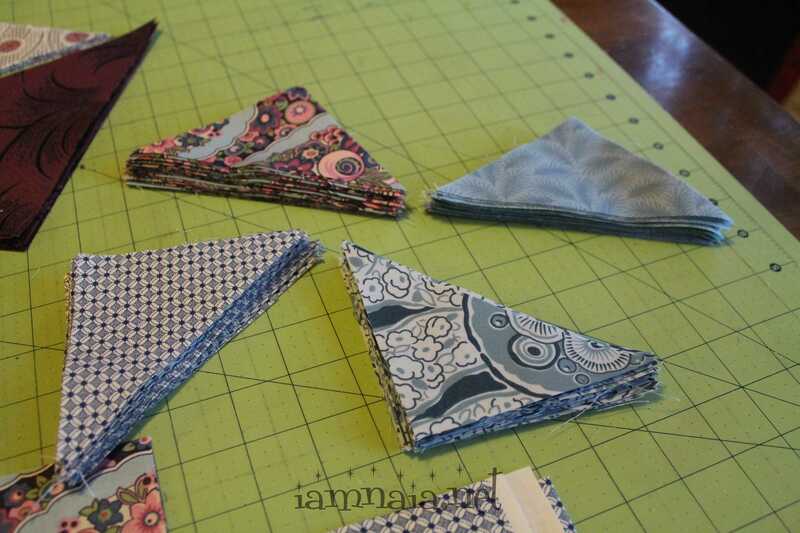 I eye-balled the size I needed and cut the 5″ squares for the inside corners and pieced them in. Because it was so random as I was going, they are not perfectly lined up but they are really close. 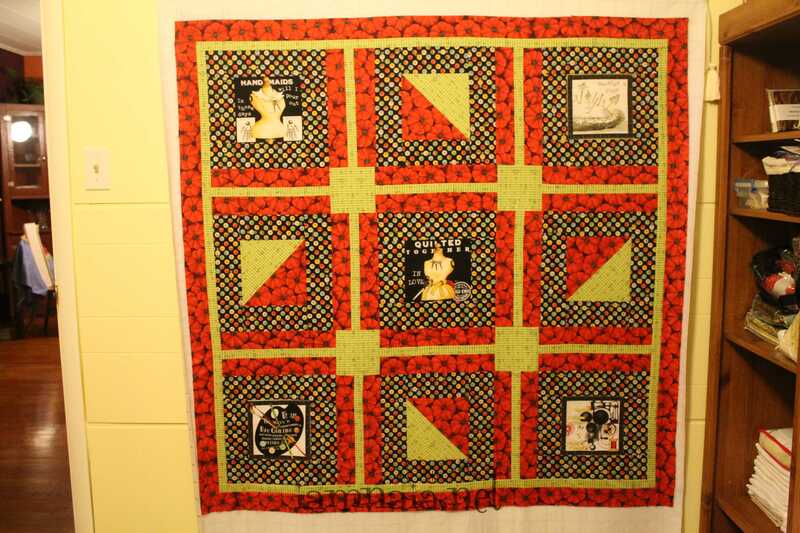 For the border, my idea was the put the yellow/green so it didn’t “cut it off” and then finish with the red. 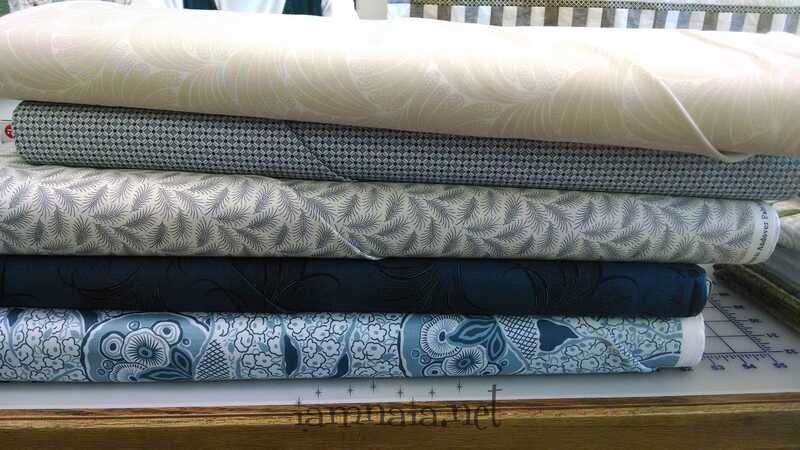 Before I did the borders, I went in to the quilt shop and told the owner that it was hers and I felt bad for making so many cool things for myself from fabric I hadn’t paid for. She hugged me. Jen got a laugh out of that – not many people actually get the nerve to hug me. I told her that she can tell people it was one yard of each fabric. I got a little extra for the borders but I didn’t need but a titch of it. If I hadn’t messed up on one part and had to recreate it, I wouldn’t have even needed that titch. For now, I have a job (not paying, of course). 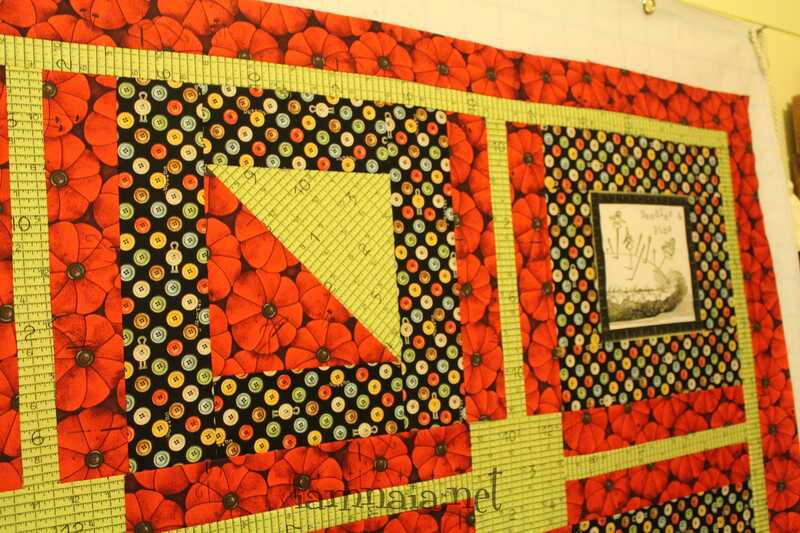 I make quilts to show off in the local quilt store and help the owner sell the fabrics. Not a bad deal, if you ask me! 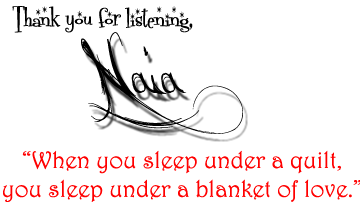 I’ll post pictures of the quilt store (with my items, of course) as soon as I can. This weekend, I’m going to an all day quilt retreat. It’s a class/retreat from 8 a.m. to 8 p.m. Jen’s going and I know there will be lots of pictures!